The postal system here is anything but predictable. An average letter or package takes 4-6 weeks to get here from the U.S., but there are no guarantees. Here in Ukarumpa, we didn’t get any mail the whole month of December! There have been different explanations for this rolling around, but no one is 100% sure what exactly happened. Once our mail reaches Port Moresby, it is transferred to our airplane hanger there. Our airplanes make flights to Port Moresby every Monday, Wednesday and Friday. Passengers and their cargo get first priority, and then if there is space, the planes bring up the mail. So if the flight schedule is busy, then it might take a while to get all of the mail up here. In December, there was no mail delivered to the hanger, so the planes didn’t have anything to fly up. That means that many of us are having a late Christmas this year. 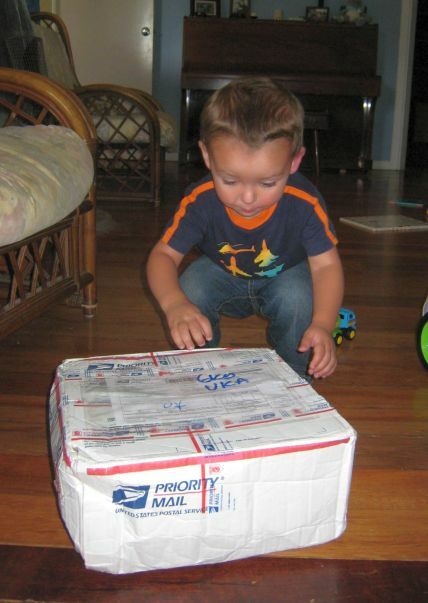 Our families sent packages with presents, and they sent them with plenty of time (they thought). My mom said that she got a notice that her packages cleared customs in PNG in early December. But we haven’t started getting them until now! Who knows what they were doing for more than a month in-between. We got our first Christmas package on January 12. Then on the 16th some Christmas cards arrived. One package on the 19th and one more today. They funny thing is that the package that arrived today was mailed December 12 – a full week after one of the packages that we haven’t seen yet supposedly cleared customs in Port Moresby! So, in Papua New Guinea, Christmas is the holiday that just keeps on giving. We think that there are still a few more packages on the way, so we’ll just keep checking our mailbox.